Patient comfort is a priority at Thornton Dental Care. We want you to feel at home during your time here. Instead of a traditional, stuffy waiting room, you can relax on our comfortable couches and chairs as well as enjoy our cozy fireplace. There is also a room catering specifically to children. There are toys and books to entertain your child as you await your appointment. 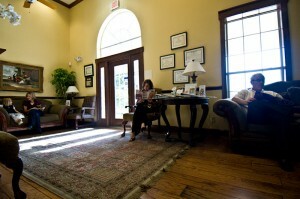 Our procedure rooms are always clean and crisp, as well as inviting. Modern architecture and interior designs complement our advanced instruments. Should you everneed anything during your time here, please ask. We strive to make your visit the most comfortable and memorable experience.